Making even King LeBron dance, like the blowing in the ear, air guitar Lance. 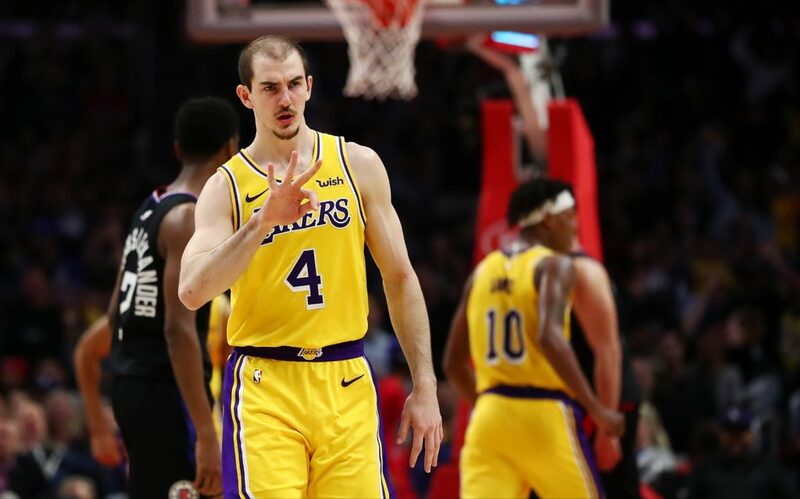 New Andre Ingram G to big league sensation Alex Caruso hit big again last night. Just like his off the rim put back, ‘put him in next year’s slam contest’ dunk from the last game against the Warriors that put everyone off the bench and on their feet. Is it too harsh to call him the ‘Bald Mamba’?! Dude this writer with thinner hair than his own arms feels your pain. Either way this kid needs a new nickname because it’s no longer the sound of The Ringer’s, “hey what’s up man, I’m Alex” joke. Garbage time in the NBA means a lot more to hoop head purists than it does to those clock watching like 4.25 on your Dolly Parton shift, or looking like a Kardashian sat courtside in Tinseltown for the glitterball paparazzi. And the Lakers have had a lot of trash time and talk to throw out lately. After being eliminated by the guy they said couldn’t lead two weeks back when D’Angelo Russell took his Brooklyn Nets one step closer to the playoffs, the Lakers last run of games have arguably been for nil. Especially with everyone losing on purpose for the big tank that is Duke Zion. But no. Not the Lakers though. They’ve been playing for pride. Like they’ve still got a horse in this race (as much as I’m against that sport, especially this weekend). Like they could still sow a playoff seed. Even with James getting ready for ‘Space Jam 2’ and shutting it down for the season after playing through the pain. Only a King can invent an injury like “load management”. But all joking aside it’s time to honour all he has carried on his back and broad shoulders in Hollywood, even with this blockbuster flop of a season. ‘Bron joins the young core likes of Brandon Ingram, Kyle Kuzma, Josh Hart and Lonzo Ball in suit and gifted necklaces on the catwalk that is courtside. Four guys who along with the rest of this teams future and a couple of memes were Magic offered up out of a top hat for New Orleans Pelican Anthony Davis. All for not even one white rabbit to follow. 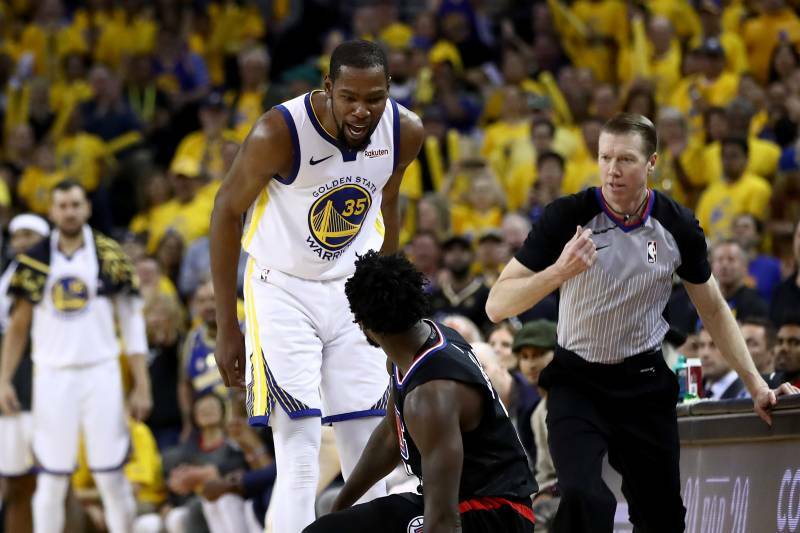 As the only thing that disappeared was this teams chemistry adding splinters in the bench insult to the injuries that already took this team from a fourth seed who could even finish off the Warriors without their King, to one who took it in the groin. But the chemistry is back now like fourth period after biology and physics. As this garbage time has helped cement this team like covering up a landfill, or the mess all that “Magic” made, as this unit has swept up and cleaned up house together without having to give anyone else up like being Rick rolled. Apart from Ivica Zubac. Sniff. We miss ‘Zu. But last night as this now Clipper stared down Mike Muscala and his old Lakers at STAPLES as the home team, the Lakers vowed to not learn from their Russell and Randle mistakes yet again in this karmic season as they showed the cross-court Clippers this was their house too and first. L.A. was the Laker way again. All day. As they took back the series with a 122-117 win to help close out a close call of a season. And this clock eating time got you to spend some with some more Lake Show stopping talents. Like the big man dunking and blocking spring that has been McGee all season. Or K.C.P. who from three has turned into the last ball on the contest shooting rack. But the only thing just as promising as the Lakers future with their young core and the numbers they pick on the lottery (hello number 1), is their two-way development of G-League players. A serious hoops hotbed league of Gatorade ready to go off the bench talent. We’ve already seen the 10 days they’ve offered to heroes from the South Bay like ‘Dre. And rooks like the hopping and hooping Johnathan Williams are showing and earning their pay that their time to clock in for more is coming too like the ticking hand. But how about Alex Caruso? A.C. is keeping it fresh like Laker legend Green. Alex can create for himself, hustle hard to the basket and find his own shot. But give him the open lane or town for a big bucket, he’s either going to throw it up or put it down with a highlight reel worthy of this Hollywood. The kid who does all the dirty work has that flash. A.C. is fresher than air conditioning. And last night he rewrote another career high with 32 points and 10. Save the 10 days. Give this young future of the show a full 82. Like last nights commentator channeling his inner ‘Django Unchained’ and waltzing with Christophe, “that’s a bingo”! Punch this kids ticket. There’s more than one way to make it in this league like a draft of wind. The time and tide is changing to a new forecast in So Cal. Even this Laker fan a couple of months ago when the team was trying to find an open roster spot for legend and LeBron friend Carmelo Anthony was ignorantly saying, “just get rid of one of those two-way South Bay guys”. But now Caruso over Carmelo, I eat those words like ice in the front offices glass of water with a fizzing Alka Seltzer for that elimination. At this point I wouldn’t even trade Anthony Davis for this guy. Hey man, this is Alex.